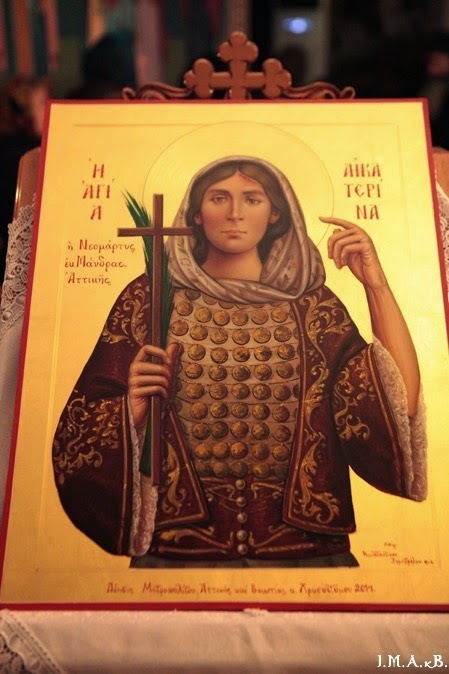 The Martyr Catherine (Routtes), who suffered for the traditional Church calendar very soon after the introduction of the “new calendar” and the Venerable Father Pachomios of Chios, a monk who reposed in peace. A life of Saint Catherine in English. 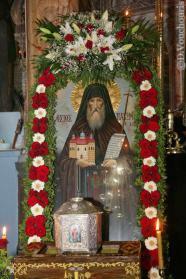 Holy New Martyr Catherine and Venerable Father Pachomios, pray to God for us! 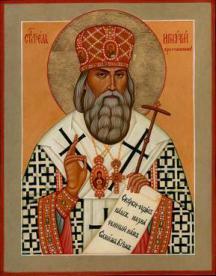 More information regarding the method of recognition of Saints in the Orthodox Church is found here. Let us not be overcome by unbelief and give ourselves up to all kinds of cares, anxieties, imaginations, day-dreaming, subterfuges and maneuvering to guard ourselves from our enemies and to work against their ill-will or evil intentions. 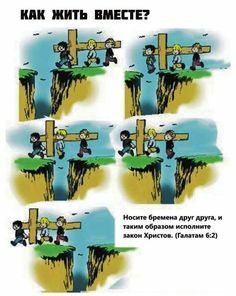 This is forbidden by the Lord, Who says: Do not resist injury. When oppressed by difficult and painful circumstances, let us have recourse to God in prayer; for in His complete power are we and our enemies and our circumstances and the circumstances of all men. He can by His absolute power and supremacy dispose of and annihilate all the greatest difficulties. Let us pray for our enemies with great care, and by this prayer obliterate their malice from their hearts and replace it with love. For more see the October edition of the Church magazine The Shepherd, from the St Edward Orthodox Brotherhood. What does it mean to carry one another’s burdens? Igumen Methodius gives a sermon on persistence in faith - persistence in prayer, patience, love, forgiveness, and in fulfilling all the commandments of our Lord Jesus Christ. Metropolitan Agafangel expounds further about the necessity of Christians having patience with one another’s weaknesses and passions. The earthly Church is held together by oneness of faith and the common goal and ideal of reaching heaven and eternal life with God. Everything else is of secondary importance, and in such matters, every person has freedom. The Church is not an organisation. It is not a formal institution, such as the Old Testament Church was at the time of the pharisees and sadducees. They did not recognise their Messiah, because they themselves had no spiritual communion with God! The Church is the mystical Body of Christ! Are we humble? Do we carry one another’s burdens? Do we forgive others? Do we ask forgiveness from our whole heart? Do we repent? Are we fit for the Kingdom of God? See also Fr Seraphim Rose’s comments on the nature of the Church as understood in our times, some questions that may arise in the contemporary world. Vladika Averky was the Abbott of Jordanville Holy Trinity Monastery, the seminary instructor of whole generation of priests in the Russian Orthodox Church Abroad, and spiritual father to monks such as Fr Seraphim Rose, who later transmitted Vladika Averky’s teaching and understanding of our times to English-speaking faithful. A prophet is killed because of his love of truth and virtue! Today the Church celebrates the death of St John the Baptist, solemnly urging all its children to fast this day. This is to remind them what is the end of the pleasures of this life, particularly those “pleasures” that are illegal and sinful. Christians should live for the future life, for life with God in Heaven. The children of the Church prove their love for God by fasting this day, and fasting from unlawful and sinful “pleasures” all the days of their life. 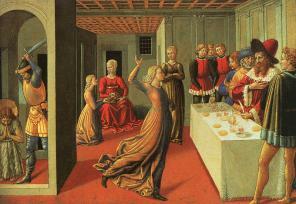 John accused Herod on account of his evil deeds, but especially concerning Herodias. 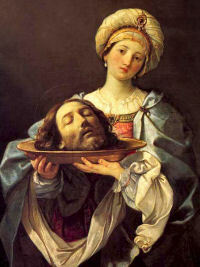 She was Herod Antipas’ brother’s wife, whom he had seized and illegally wed. John said to him, ‘It is not lawful for thee to have the wife of thy brother.’ Finding the reproach, or rather, the reproaches, unbearable, Herod added this to his other evil acts, that he shut up John in prison. Herodias was angry. She was knew she was committing adultery, but the law of God meant nothing to her. How many people today inwardly say the same? How many adulterers today would not kill the Prophet of God, if given the chance? She, by her own efforts and wiles, accomplished the deed and saw it through to its conclusion…She inwardly cherished malice against John….She wanted him dead…For she figured that there was no other way to silence what she took to be an accusation against herself. The abomination in which she was involved did not have just one or two aspects. It was highly complicated. It was a matter of adultery, the most shameful of sins. 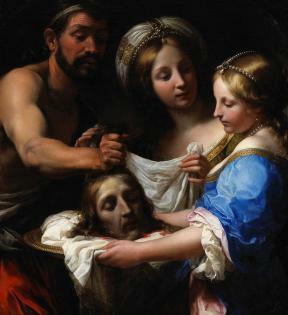 And it was adultery by none other than the brother of the adulteress’ husband, the father of her daughter…Even if the husband had died, his brother could not marry the widow according to the law of Moses….Herod, furhtermore, did not perpetrate this shameful deed secretly or with any sort of dissimulation. He accomplished the abomination openly and shamelessly. Hardened sinners always hate their accusers. A sinner always hates the person who hinders him in indulging his sinful passion. And those around them, indulging in the pleasures of life, become blind to truth and ready to follow the most lawless suggestions! Hearken, you virgins, or rather, you wives also, as many as consent to such unseemliness at other person’s weddings - leaping, and bounding, and disgracing our common nature. Hearken, you men too, as many as follow after those banquets - full of expense and drunkenness - and fear the gulf of the evil one. For indeed, so mightily did he seize upon that wretched man Herod just then, that the latter swore even to give the half of his kingdom. This is what Mark states: “He swore unto her, such was the value he set upon his royal power,; so was he once for all made captive by his passion, as to give up his kingdom for a dance. The princess dances, and the better she dances, the more evil it is. For it is shameful for a princess to be skilled at doing something unbefitting…Satan dances by means of the young girl. These four lead to fornication: (1) eating and drinking; (2) oversleeping; (3) negligence; and (4) decoration of clothes. If thou dost wish to make thy repentance before God, beware of living in luxury. For this stimulates all passions and dispels the fear of God from the heart. But control af the body diminishes the effects of other desires. Desire of food awakens the passions and emotions. So, again, they are controlled by fasting. 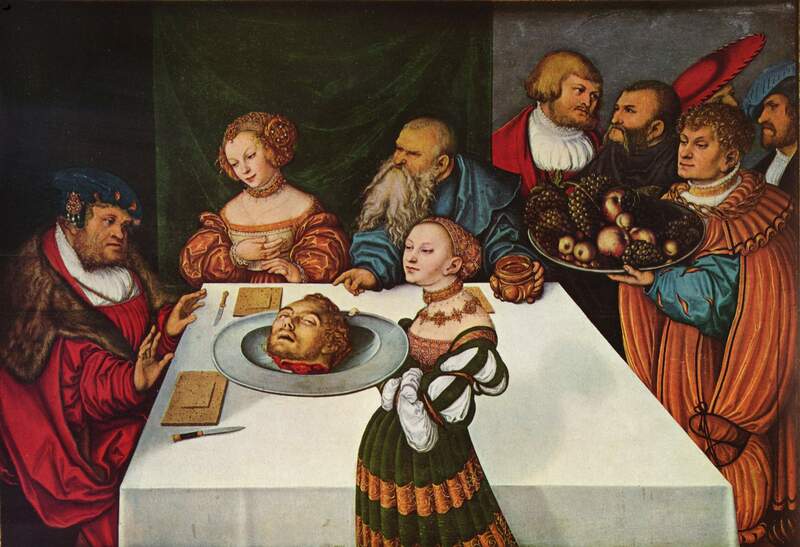 Who would not have shuddered to see that sacred head, dripping blood, set forth at the feast? But not so the lawless Herod, nor the woman more accursed than he. For such is the nature of the unchaste among women; none so audacious and so savage as they. For if we shudder at hearing these things, what must we suppose of the effect of that sight at the time? What of the feeling of those who sat with him at meat, on seeing blood dropping from a newly-severed head the midst of the revel? But as for that bloodthirsty woman, and fiercer than furies, she had no feeling at that spectacle. But she even took delight in the dripping gore of the slaughter; yet if nothing else, surely the mere sight, it was to be expected, would effectually turn her cold. But no such feelings had she, the murderess, and full of thirst after the prophet’s blood. For such is the nature of whoredom. It makes men not wanton only, but murderous also. Those women at all events, who desire to commit adultery, are prepared even tfor the slaying of their injured husbands - and not one only, nor two, but ten thousand murders are they ready to venture upon. And of this sort of tragic there are many witnesses. Why does the Church take such a strict view of dancing? 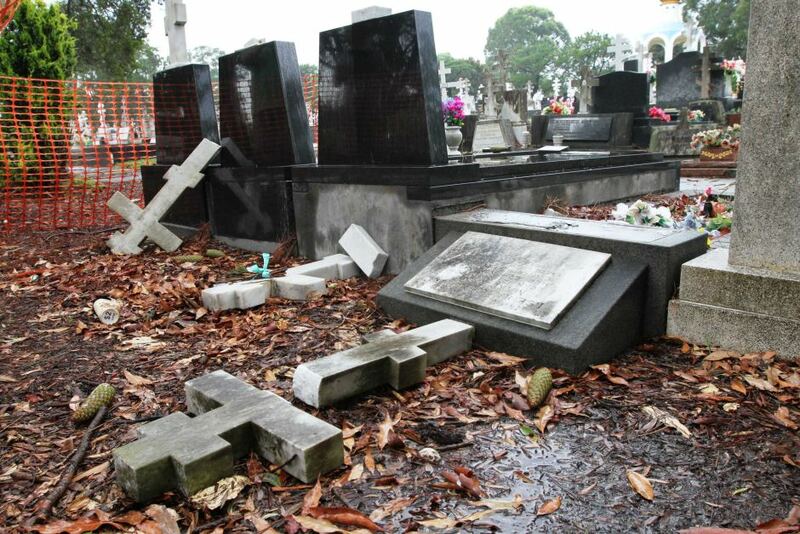 …because it harms morality…anyone who breaks the commandments of God, kills his soul. Amongst the commandments, there is the very important 7th commandment, which prohibits sins against morality: “Do not commit adultery”. This commandments it binding not only for monks, but also for lay people who wish to be true Christians and save their souls. One cannot think, as many unfortunately do now, that a moral life is required only of monks, who deny themselves marriage, and that lay people may live in moral decadence, however they please….True Christianity…allows marriage, a lawful marriage, blessed by the Church - every other kind of bodily cohabitation in the two variants of adultery and fornication is seen by the Christian Church as a heavy sin, equal with murder and denial of the faith, as life itself shows us it is. Therefore it is not surprising that the Church condemns anything that leads to these sins. The holy and ecumenical [6th] Council universally prohibits so-called pantomimes and their theatrical exhibitions; afterwards, in keeping with this, also the spectacles of wild-animal fury and of hunters’ prowess, and the execution of dances on the stage. If anyone flouts the present Canon, and gives himself over to any of the things herein prohibited, in case he is a clergyman, let him be deposed from office; but in case he is a layman, let him be excommunicated. 51st Canon of the 6th Ecumenical Council. …Furthermore, the public dances of women, which are calculated to wreak great harm and injury. 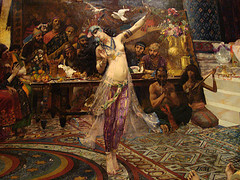 Furthermore we dismiss also the dances and ritualistic ceremonies performed by men or women in the name of what are falsely called gods among Greeks, after an old custom which is alien to the life of Christians, at the same time decreeing that no man shall put on any feminine costume, nor shall a woman put on any that befits men. But neither shall anybody put on comic, or satyric, or tragic masks; neither shall anybody shout the name of abominable Dionysus while engaged in squeezing grapes in the wine-presses; nor, when pouring the wine into the casks shall they provoke laughter by a show of ignorance or of vanity, by producing the effects of demoniacal delusion. As for those who from now on attempt to carry out any of the aforesaid improprieties, while well aware of what they are doing, if they should be clergymen, we command that they be deposed from office; but if laymen, that they be excommunicated. 62nd Canon of the 6th Ecumenical Council. These strict canons are as binding for Christians as the ones prohibiting heresy! This is how dangerous the holy fathers consider improper feasting, luxury, acting and dancing for the immortal Christian soul. 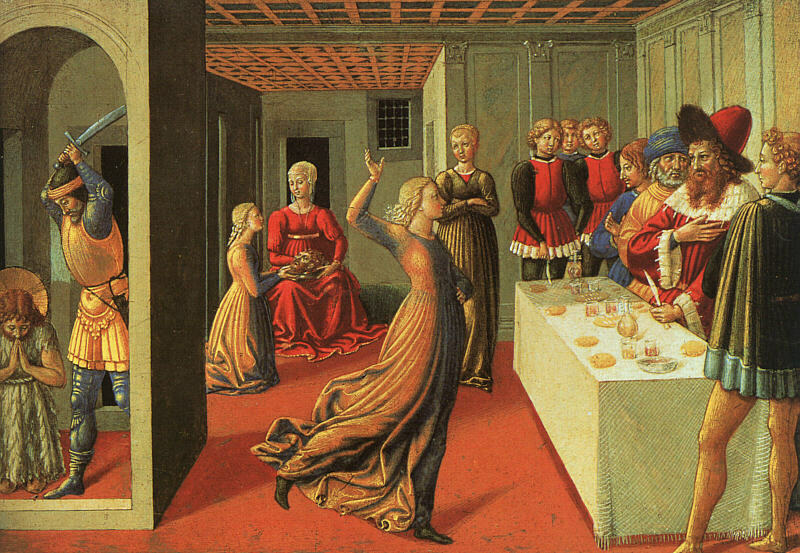 For every true Christian these kinds of women’s dances should be disgusting, because they involuntarily remind of the dance of Herodias’ daughter, whose victim became “the greatest one born of women” - the forerunner and Baptist of the Lord, St John. For where dancing is, there is the evil one. For neither did God give us feet for this end, but that we may walk orderly: not that we may behave ourselves unseemly, not that we may jump like camels (for if even they too are disagreeable when dancing, much more women), but that we may join the choirs of angels. And mark too the very mode of asking. “Give me here John the Baptist’s head in a charger.” Dost thou see how Herodias was lost to all shame, and became altogether the devil’s? The teaching of the Church, founded on the the Saviour’s coming to earth, will always remain unchanged. The true Church cannot adapt to the spirit of the age and tickle people’s passions. And if modern Christians do not wish to hear the voice of the Church, then this makes it worse for themselves…It is not for the Church to follow after life - but for life to follow the Church. It is not for life to judge the Church and Her teaching and rules, but rather, the Church is given right to judge life by Her Divine Founder, our Lord Jesus Christ, who said: “if [a sinner] neglect to hear the church, let him be unto thee as an heathen man and a publican”, and who also gave the servants of the Church the awesome power to bind and loose the sins of people. Salome set out across the frozen river Sikaris one day. The ice broke, and she fell into the water up to her neck. Shards of ice jammed around her neck and she struggled, treading her feet in the water, as she once danced at the court of Herod. She was unable either to raise herself up or to sink down, and a shard of ice severed her head. The water carried her body away, and her head was brought to Herodias on a platter, as was once the head of John the Baptist. Behold, how terribly a death resembles the sin committed. The glorious beheading of the forerunner was part of God’s dispensation, that he might proclaim to those in hades the coming of the Saviour. Let Herodias, who demanded the iniquitous murder, therefore lament; for she loved not the law of God nor the age of life, but rather this false and transitory one. Through the prayers of the Holy Prophet, Forerunner and Baptist John, Lord Jesus Christ, our God, have mercy on us sinners, living in the modern, decadent world!